Happy Friday! It's actually a pretty nice day here in Seattle, so it's starting to feel like Spring! I really need to get some good vitamin D soon, because all of this rain and cloudy weather is seriously making me feel so blah. As this year is coming to a close, I was reflecting back on what this time was like during my senior year of high school, and what all has happened these past three years at college. 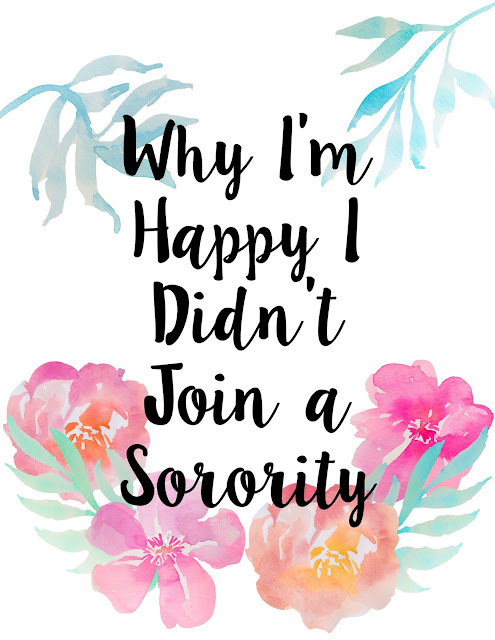 I found myself talking to my friends the other day about Greek life, and I remembered the decision I was struggling to make just three years ago, about whether to join a sorority or not. Since I've never talked about it on my blog, I decided today I would do just that! I feel like a lot of bloggers out there are really involved in Greek life, and that's great! I just wanted to bring a new perspective to the table, and show people that it isn't the only option in college, and that you can still find really great friends and a wonderful place to fit in. When I went to the "accepted students tour" at the University of Washington, I saw that there was a panel on Greek life (basically, sororities and fraternities). I was interested about it and read further about all of the sororities on campus. I had never really thought about rushing before, and I had just assumed that I would find a roommate and live in the dorms. I had never really had any exposure to Greek life; my family doesn't have some long line of being in a certain sorority, and none of my friends who had gone onto college had ended up joining sororities. The idea of having a group of girls you could be close with sounded really great to me, so I started to think about possibly rushing. A couple of girls in my orientation group had decided they were definitely going to rush. We were all on the same level, though, and none of us had joined sororities. They were nice, and we quickly became friends. They were fully consumed in wanting to rush, and were extremely excited to find their sorority. The prospect of living in a house with upwards of forty girls didn't scare them, like it did me. At the time of my orientation I had already been talking to my future roommate on the roommate finder app my school had (it was seriously like online dating! ), so I was pretty sure I was going to live in a dorm. Still, though, a little part of me wanted to rush and join a sorority. I don't have any sisters, so I thought it would be cool to experience what that was like. However, I am an introvert, and the idea of living with a ton of girls, and having to be energetic and sociable didn't appeal to me. It seemed a little overwhelming the sheer amount of events sororities hold, and a lot of work as well. I like alone time, and peace and quiet when I get stressed out, and I didn't think I would get that in a house full of girls. I thought a lot about the possibility of rushing throughout orientation; I met a lot of different girls with a lot of different opinions about rushing. By the end of orientation, I decided I didn't want to rush, and my friends who did quickly lost contact with me. I don't hold any grudges about that, our lives are very different, and we made other friends with similar interests. It was a little disappointing that they decided they didn't want to remain friends with me once the school year started, just because I wouldn't be involved in Greek life. When I got to school in September, I had so many mixed feelings. I was upset about leaving my family (especially my dogs!) for an extended amount of time, since I never had before, but I was also really excited to finally have some freedom. Ultimately, I'm really glad I was able to go through these emotions in a dorm room with my one roommate, instead of a giant house filled with a lot of noise and other people. The dorms were quiet at first - people were nervous to open their doors and interact with others when it was their first day of college. That nervousness was broken, however, with a night of Cards Against Humanity in the lounge. We all got to know each other, and I made friends I'm still close with today - I actually met my boyfriend that night even though we wouldn't go on to date until December of 2016! Dorms most made me nervous because I was afraid I wouldn't be able to make friends or that people would be really closed off. My floor was the opposite, though, and a lot of us kept our doors open most of the time so we could all hang out. We all quickly became close, and I found girl friends who I could talk to and spent most of my time with. I had found the connections I wanted from a sorority, without going through all of the other factors I had no interest in. My experience not joining a sorority has been great; I have found great friends, and joined clubs that allow me to be as social as I want to be, and I'm so happy I lived in the dorms for the first two years for college. There is absolutely nothing wrong with joining a sorority if you think that's what you want, but if you're wanting to make friends in college, it definitely is not the only option out there. Don't let what your friends are doing influence you, it isn't bad not to join one. What's your take on Greek life vs. dorm life?